The VoiceLive Play offers powerful vocal processing with simple footpedal control. TC Helicon, who specialise in vocal processing, offer products in a variety of formats. I've previously looked at their VoiceLive Touch and VoiceLive Rack, which both use capacitive touch control for accessing a wide variety of voice-optimised treatments. For those who aren't familiar with TC Helicon's current range, the company's goal with these products is a noble one: to bring studio-like vocal processing to the stage. They aim to do this by providing a comprehensive set of effects tailored for the voice within a single unit, including preset-based adaptive compression, de-essing and equalisation; pitch processing in the form of correction, doubling and hard tuning (think Kanye West-style Auto-Tune); and conventional effects such as reverb, flanger, delay, chorus, rotary speaker, distortion and so on. The VoiceLive Play's chassis and control system has a lot in common with TC Helicon's stomp boxes, such as the VoiceLive 2 and 2 Extreme. These units squeeze a lot of power into a multi-pedal format, giving the singer the same effect-changing freedom that guitarists will be used to. Housed in a sturdy metal shell, the VoiceLive Play's controls are somewhat stripped down as far as multi-effects units go, comprising just three footswitches, a continuous rotary encoder and several rubber buttons, and the device is a little less intimidating too. The footpedal controls themselves are pretty easy to grasp. The upward- and downward-facing arrows scroll through patches (and activate the simple looping function when held together), while the 'Hit' footswitch adds a second layer of effects to the current patch. Holding the 'Hit' button down for a while activates a 'Talk' mode that leaves the signal dry, allowing you to address the audience. Since these are the only footpedal controls, editing patches on stage is quite impractical. It's fair to say that the Play works best if you programme the effects patches before your performance. Above the pedals is a continuous encoder that allows you to input changes to parameters, with left- and right-facing arrows for menu navigation. The Back and Store buttons do exactly what you'd expect: go back a menu step, and allow you to store and name the current patch. All except the encoder are illuminated in blue or white depending on the status of the unit. The main display is flanked by six rubber buttons, which are also illuminated. As well as selecting adjacent parameters in menus, these buttons each have a discrete function. An LED on the upper left of the chassis gives an indication of the microphone input level by changing gradually from green to red. The level is controlled by a thumbwheel on the left-hand side of the VoiceLive Play. The VoiceLive Play features a USB connection for computer-based patch management and audio streaming. It also hosts two small side-mounted mics designed to detect the key of your song. The main inputs and outputs are as you'd expect: a mic input and a stereo XLR output. As well as these, there's a USB input for uploading new firmware, patch management via computer software, and streaming stereo audio to and from a host computer. There's also a headphone mini-jack output, while the mini-jack 'Aux' input allows connection of an MP3 player or similar device. You can use this to sing along to MP3 tracks while the VoiceLive Play attempts to filter out the track's lead vocal. Two internal 'Roomsense' microphones can listen to surrounding instruments through slits in the side of the chassis. Odd as it may seem, these listen for the key of your song, and can follow its chord progressions to help ensure accurate harmonies. How successful this is depends on the sound sources you're near to, plus how close their tuning is to the fundamentals of the current chord, so it's a shame that the usual jack or MIDI socket isn't included for direct instrument following. The option is there to use the TC Helicon MP75 Modern Performance microphone to control the activation of a single parameter in the VoiceLive Play, as defined in the Setup menu. I used this microphone when reviewing the VoiceLive Rack, and found it to be a worthwhile alternative to the standard SM58. Editing patches is pretty easy once you get your head around the layout of the unit, and if you're used to TC Helicon devices the parameters will be clear to you. If not, it doesn't take too long to pick up the terminology. The 'Genre' button allows you to scroll through patches by genre of music: all of the presets are based on a famous song or artist, and are designed to make your voice sound similar to the vocal of the song. They can be a good starting point for inspiration within a particular style, but I also found the 'Favourite' genre useful. Using the 'Favourite' button, you can easily add any current patch to this list, limiting the available patches to the Favourite list. The 'Effects, 'Setup' and 'Mix' buttons let you craft the current patch using seven effect categories, as well as parameters such as the key for harmonising and the mix balance of effects. You can also assign each of the seven effect categories to activate when the 'Hit' button is pressed, for a nice effect boost in the chorus, for example. The mainstay of other members of the VoiceLive series is their intelligent harmonising, which uses two voices in the VoiceLive Play. That's not quite as many as the VoiceLive Touch or Rack, but it will give you a three-part harmony. Since melodic harmony tracking is so dependent on either the 'Roomsense' mics or your song staying in a single key, I found the fixed-note harmonies to be the easiest to work with. Realistically, you won't be fooled into thinking that there are two more actual people singing, but once the sound is in a mix (and balanced subtly) the effect is more convincing. As well as the karaoke-like MP3 sing-along mode, there's 'Practice' mode, which has a dedicated button. It's actually quite good fun, as you can see just how the pitch detection is working (as well as how far off-key you are) using the on-screen display. I don't tend to sing staring at my feet, though, so I balanced the pedal on a music stand in front of me to try this out. Of course, nothing beats a bit of good old-fashioned passion in a performance, but the practice tool is quite a useful aid, and can give you an idea of how you may need to improve, as it tracks your 'problem notes' and whether you're usually sharp or flat. The VoiceLive Play occupies a nice spot in the TC Helicon range: it offers a lot of different processing options for the live vocalist, but is sufficiently robust that you won't feel worried about using it in the average venue. Compared to some similar products, it doesn't look at all out of place alongside guitar pedals, amps and other such stage gear, and the footpedal control works well. Aside from using the 'Favourites' genre to tag a playlist quickly, I found the genre selection useful only as a starting point. This feature, combined with the MP3 vocal removal, were a bit too 'karaoke' for me, though they might find some use with other less experienced users who are looking to learn to make a chart pop sound with no fuss at all. As with most processors of this kind, successful use in a real-world situation relies on you preparing your patches beforehand. You'll be able to use the VoiceLive Play's software to shuffle patches around and put them in the correct order for a set-list, after which you'll have one or more named patches for each song. Using the Hit control for a boost is a perfectly natural feeling, too, like kicking a guitar distortion pedal for a big chorus. If you like the idea of the processing in units like the VoiceLive Touch and Rack but don't want to spend quite so much, the Play is a robust way of acquiring this type of a sound for less cash. The hard-tune mode and the noticeably digital sound of the doubling and harmonies are especially suited to urban, chart pop and electronic music, while singer-songwriters will be likely to find the subtler effects and a lower mix of harmonies useful, since a less obvious effect sits much more comfortably in the mix. Despite the fact that it's more limited than some other models in the range in terms of customisable effects, I found the footpedal format easy to use when actually singing. Although the VoiceLive 2 and its 2 Extreme stablemate provide both greater and more direct control over tone shaping and effects, the Play rewards careful programming beforehand and — most importantly for a singer lost in a performance — keeps things simple on the stage. As well as other products in TC Helicon's VoiceLive range, alternatives include Digitech's Vocalist Live series, which are a direct competitor in the footpedal vocal effects market. Be sure to check out the reviews of the VoiceLive Touch and Rack in SOS October and December 2011 respectively. 'Hit' button is great for boosting choruses. Easy to program and operate on stage. 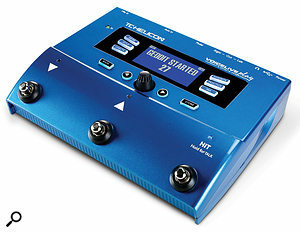 The VoiceLive Play combines the meat of the processing from TC Helicon's high-end processors with the on-stage simplicity of a stomp-box unit. Behind the big-name presets is a powerful box: put in the effort to programme it in rehearsal and your performance can be augmented significantly on stage using three simple footswitches.